David Bushhouse '19 is one of only eight students from the state of Virginia to be named a 2018 Goldwater Scholar, awarded to undergraduates in the sciences, mathematics, and engineering. 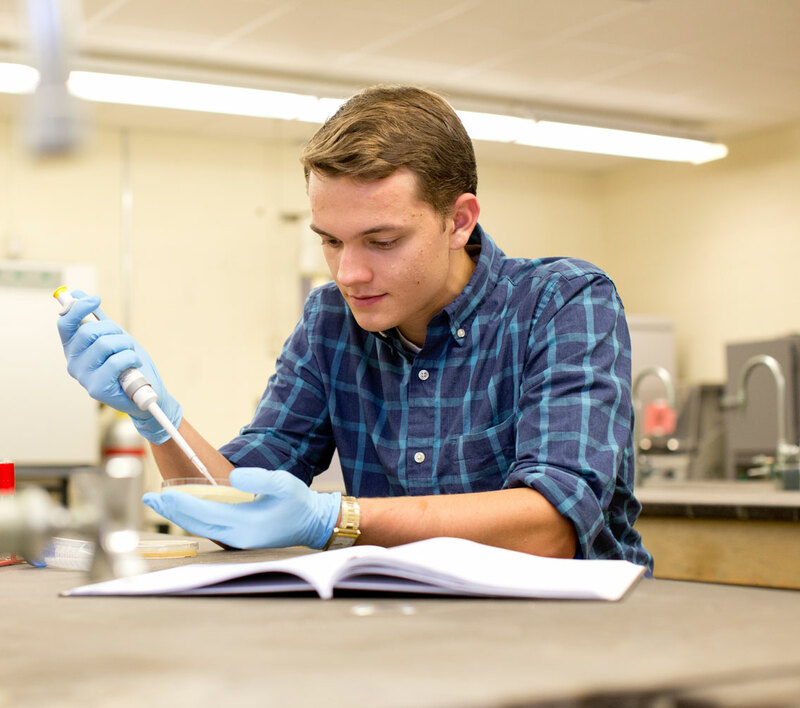 Hampden-Sydney College congratulates biology major David Bushhouse '19, one of only eight students from the state of Virginia to be named a 2018 Goldwater Scholar. The Goldwater Scholarship is the nation's premier undergraduate scholarship in the natural sciences, mathematics, and engineering; this year, 221 Goldwater Scholars were chosen from a national field of candidates nominated by more than 2,000 colleges and universities. 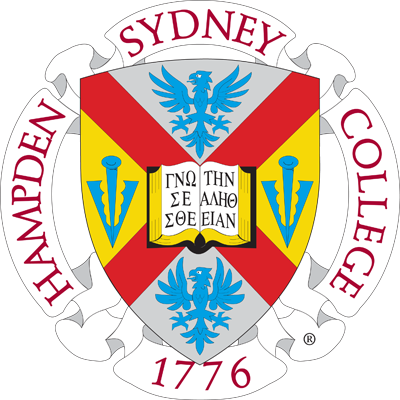 It is the third time in the past five years that a Hampden-Sydney student has received the prestigious award. David was recognized for his ongoing research on tumor immunology with Dr. Kristian Hargadon '01, Elliot professor of biology and a Goldwater Scholar himself during his student days at H-SC. They are determining, on the molecular-genetics level, how a protein called FOXC2 regulates the spread and metastasis of melanoma skin cancer. Hargadon explains, "Though we have shown that FOXC2 influences melanoma progression, the mechanism by which it promotes melanoma growth and metastasis remains largely unknown. David's work has been instrumental in optimizing a technique that will allow for the identification of genes activated by FOXC2, which may, in turn, suggest novel targets for cancer therapies designed to delay or prevent melanoma progression." David began his research last summer as part of Hampden-Sydney's Honors Program. Although he put the project on hold this semester so he could study abroad in St. Petersburg, Russia, David looks forward to resuming his work in the lab next year as his Honors Capstone project. In his three years at Hampden-Sydney, David's leadership across campus and across the academic disciplines has distinguished him as a true liberal arts scholar. In addition to his substantial work in the lab, David is a senior member of the College's UPLS debate society, president of the faith organization Cogito, and the announcer for Tiger football. He has held editorial positions with the Tiger newspaper, the Hampden-Sydney Journal of the Sciences, and The Hampden-Sydney Poetry Review. He even won the College's poetry prize last year at Convocation. "Hampden-Sydney has been a great environment for David because it has allowed him to develop and integrate all of his talents into becoming a complete scientist: creative, attentive to detail, articulate, determined, and unflappable." Dr. Cristine Varholy, director of the Office of Fellowship Advising, credits the College's recent success with the Goldwater Scholarship to the interdisciplinary nature of a Hampden-Sydney education—our students' ability to articulate their goals in a clear and engaging manner makes their applications stand out—as well as the excellent student research opportunities available at H-SC. "It's really a testament to the quality of work that our science faculty is doing and the research opportunities that they give our students," says Varholy. "The time that Hampden-Sydney students spend in the lab, the tasks and the problem solving that they are allowed to do, and the contact that they have with their professors definitely set them apart in the competitive process." David was inspired to apply for the Goldwater Scholarship after James Lau '17 won the award two years ago, and he is thankful for the guidance he received from Hampden-Sydney faculty and staff during the lengthy application process. "This win would not have been possible without the help of several faculty members," he says. "Most importantly, Dr. Varholy helped me work out how to clearly and convincingly express my personal and professional motivations for pursuing a career as a scientist, and Dr. Hargadon helped me develop a research proposal that demonstrated my competence applying the scientific method to unanswered questions. I also relied on the counsel and careful eyes of several other faculty reviewers and the Ferguson Career Center staff. It was really encouraging to see so many professors putting their shoulders to the wheel in order to help my application be the best it could be." All of the faculty and staff who worked with David through the Goldwater Scholarship process welcomed the opportunity to help a young man with such potential. "I could not be prouder of David and all of his achievements," says Hargadon. "He is one of the most talented students that I have ever worked with at any level, and he is most deserving of being named a Goldwater Scholar. This award will open so many doors for David throughout his career as a research scientist, and I expect his name is one that many will come to know outside the gates of H-SC very soon." David Bushhouse will attend Northwestern University, where he received a full scholarship and stipend to pursue his Ph.D. in the Interdisciplinary Biological Sciences Graduate Program.